This article is about the U.S. politician Henry Cabot Lodge (1850–1924). For his grandson (1902–1985), see Henry Cabot Lodge Jr.
Henry Cabot Lodge (May 12, 1850 – November 9, 1924) was an American Republican Senator and historian from Massachusetts. A member of the prominent Lodge family, he received his PhD in history from Harvard University. As an undergraduate at Harvard, he joined Delta Kappa Epsilon Fraternity. He is best known for his positions on foreign policy, especially his battle with President Woodrow Wilson in 1919 over the Treaty of Versailles. The failure of that treaty ensured that the United States never joined the League of Nations. Born in Beverly, Massachusetts, Lodge won election to the Massachusetts House of Representatives after graduating from Harvard. He and his close friend, Theodore Roosevelt, opposed James G. Blaine's nomination at the 1884 Republican National Convention, but supported Blaine in the general election against Grover Cleveland. Lodge was elected to the United States House of Representatives in 1886 before joining the United States Senate in 1893. In the Senate, he sponsored the unsuccessful Lodge Bill, which sought to protect the voting rights of African Americans. He supported the Spanish–American War and called for the annexation of the Philippines after the war. He also supported immigration restrictions, becoming a member of the Immigration Restriction League and influencing the Immigration Act of 1917. Lodge served as Chairman of the 1900 and 1908 Republican National Conventions. A member of the conservative wing of the Republican Party, Lodge opposed Roosevelt's third party bid for president in 1912, but the two remained close friends. During the presidency of Woodrow Wilson, Lodge advocated entrance into World War I on the side of the Allied Powers. He became Chairman of the Senate Republican Conference and Chairman of the Senate Committee on Foreign Relations, emerging as the leader of the Senate Republicans. He led the opposition to Wilson's Treaty of Versailles, proposing twelve reservations to the treaty. He most strongly objected to the provision of the treaty that required all nations to repel aggression, fearing that this would erode Congressional powers and commit the U.S. to burdensome obligations. Lodge prevailed in the treaty battle and Lodge's objections would influence the United Nations, the successor to the League of Nations. After the war, Lodge participated in the creation of the Washington Naval Treaty, which sought to prevent a naval arms race. He remained in the Senate until his death in 1924. Lodge was born in Beverly, Massachusetts. His father was John Ellerton Lodge. His mother was Anna Cabot, through whom he was a great-grandson of George Cabot. Lodge grew up on Boston's Beacon Hill and spent part of his childhood in Nahant, Massachusetts where he witnessed the 1860 kidnapping of a classmate and gave testimony leading to the arrest and conviction of the kidnappers. He was cousin to the American polymath Charles Peirce. In 1872, he graduated from Harvard College, where he was a member of Delta Kappa Epsilon, the Porcellian Club, and the Hasty Pudding Club. In 1874, he graduated from Harvard Law School, and was admitted to the bar in 1875, practicing at the Boston firm now known as Ropes & Gray. After traveling through Europe, Lodge returned to Harvard, and in 1876, became one of the first recipients of a Ph.D. in history and government from Harvard. His dissertation dealt with the Germanic origins of Anglo-Saxon land law. His teacher and mentor during his graduate studies was Henry Adams; Lodge maintained a lifelong friendship with Adams. Lodge was elected a Fellow of the American Academy of Arts and Sciences in 1878. In 1881, he was elected a member of the American Antiquarian Society. In 1880–1882, Lodge served in the Massachusetts House of Representatives. Lodge represented his home state in the United States House of Representatives from 1887 to 1893 and in the Senate from 1893 to 1924. Along with his close friend Theodore Roosevelt, Lodge was sympathetic to the concerns of the Mugwump faction of the Republican Party. Nonetheless, both reluctantly supported James Blaine and protectionism in the 1884 election. Blaine lost narrowly. Lodge was a staunch supporter of the gold standard, vehemently opposing the Populists and the silverites, who were led by the populist Democrat William Jennings Bryan in 1896. Lodge was easily reelected time and again but his greatest challenge came in his reelection bid in January 1911. The Democrats had made significant gains in Massachusetts and the Republicans were split between the progressive and conservative wings, with Lodge trying to mollify both sides. In a major speech before the legislature voted, Lodge took pride in his long selfless service to the state. He emphasized that he had never engaged in corruption or self-dealing. He rarely campaigned on his own behalf but now he made his case, explaining his important roles in civil service reform, maintaining the gold standard, expanding the Navy, developing policies for the Philippine Islands, and trying to restrict immigration by illiterate Europeans, as well as his support for some progressive reforms. Most of all he appealed to party loyalty. Lodge was reelected by five votes. Lodge was very close to Theodore Roosevelt for both of their entire careers. However, Lodge was too conservative to accept Roosevelt's attacks on the judiciary in 1910, and his call for the initiative, referendum, and recall. Lodge stood silent when Roosevelt broke with the party and ran as a third-party candidate in 1912. Lodge voted for Taft instead of Roosevelt; after Woodrow Wilson won the election the Lodge-Roosevelt friendship resumed. In 1890, Lodge co-authored the Federal Elections Bill, along with Sen. George Frisbie Hoar, that guaranteed federal protection for African American voting rights. Although the proposed legislation was supported by President Benjamin Harrison, the bill was blocked by filibustering Democrats in the Senate. In 1891, he became a member of the Massachusetts Society of the Sons of the American Revolution. He was assigned national membership number 4,901. That same year, following the lynching of eleven Italian Americans in New Orleans, Lodge published an article blaming the victims and proposing new restrictions on Italian immigration. Of the sympathies of the American people, generous, liberty-loving, I have no question. They are with the Cubans in their struggle for freedom. I believe our people would welcome any action on the part of the United States to put an end to the terrible state of things existing there. We can stop it. We can stop it peacefully. We can stop it, in my judgment, by pursuing a proper diplomacy and offering our good offices. Let it once be understood that we mean to stop the horrible state of things in Cuba and it will be stopped. The great power of the United States, if it is once invoked and uplifted, is capable of greater things than that. Following American victory in the Spanish–American War, Lodge came to represent the imperialist faction of the Senate, those who called for the annexation of the Philippines. Lodge maintained that the United States needed to have a strong navy and be more involved in foreign affairs. Lodge was a vocal proponent of immigration restrictions, for a number of reasons. In the late 19th and early 20th centuries, large numbers of immigrants, primarily from Eastern and Southern Europe, were flooding into industrial centers. Lodge feared that unskilled foreign labor was undermining the standard of living for American workers, and that a mass influx of uneducated immigrants would result in social conflict and national decline. His position was also influenced by his beliefs about race. In a May 1891 article on Italian immigration, Lodge expressed his concern that immigration by "the races who have peopled the United States" was declining, while "the immigration of people removed from us in race and blood" was on the rise. He considered northern Italians superior to southern Italians, not only because they tended to be better educated, but because they were more "Teutonic" than their southern counterparts, whose immigration he sought to restrict. Let every man honor and love the land of his birth and the race from which he springs and keep their memory green. It is a pious and honorable duty. But let us have done with British-Americans and Irish-Americans and German-Americans, and so on, and all be Americans ... If a man is going to be an American at all let him be so without any qualifying adjectives; and if he is going to be something else, let him drop the word American from his personal description. On the moral qualities of the English-speaking race, therefore, rest our history, our victories, and all our future. There is only one way in which you can lower those qualities or weaken those characteristics, and that is by breeding them out. If a lower race mixes with a higher in sufficient numbers, history teaches us that the lower race will prevail. As the public voice of the Immigration Restriction League, Lodge argued in support of literacy tests for incoming immigrants. The tests would be designed to exclude members of those races he deemed "most alien to the body of the American people." He proposed that the United States should temporarily shut out all further entries, particularly persons of low education or skill, the more efficiently to assimilate the millions who had come. From 1907 to 1911, he served on the Dillingham Commission, a joint congressional committee established to study the era's immigration patterns and make recommendations to Congress based on its findings. The Commission's recommendations led to the Immigration Act of 1917. Lodge was a staunch advocate of entering World War I on the side of the Allied Powers, attacking President Woodrow Wilson for poor military preparedness and accusing pacifists of undermining American patriotism. After the United States entered the war, Lodge continued to attack Wilson as hopelessly idealistic, assailing Wilson's Fourteen Points as unrealistic and weak. He contended that Germany needed to be militarily and economically crushed and saddled with harsh penalties so that it could never again be a threat to the stability of Europe. However, apart from policy differences, even before the end of Wilson's first term and well before America's entry into the Great War, Lodge confided to Teddy Roosevelt, "I never expected to hate anyone in politics with the hatred I feel toward Wilson." He served as chairman of the Senate Foreign Relations Committee (1919–1924). He also served as chairman of the Senate Republican Conference from 1918 to 1924. His leadership of the Senate Republicans has led some to retrospectively call him the de facto Senate Majority Leader. During his term in office, he and another powerful senator, Albert J. Beveridge, pushed for the construction of a new navy. The summit of Lodge's Senate career came in 1919, when as the unofficial Senate majority leader, he dealt with the Treaty of Versailles. He wanted to join the League of Nations with reservations. The Democrats in the Senate, following Wilson's direction, rejected Lodge's proposal to join the League with reservations. Republicans opposed joining under Wilson's terms of no reservations which meant the League could force the U.S. to enter a war without approval of Congress. In the end the U.S. never joined the League of Nations. Lodge won in the long run—his reservations were incorporated into the United Nations in 1945, where the U.S. was given a veto. Lodge's key objection to the League of Nations was Article X. It required all signatory nations to repel aggression of any kind if ordered to do so by the League. Lodge rejected an open-ended commitment regardless of relevance to the national security interests of the United States. He especially insisted that Congress must approve. Lodge was also motivated by political concerns; he strongly disliked President Wilson and was eager to find an issue for the Republican Party to run on in the presidential election of 1920. The United States is the world's best hope, but if you fetter her in the interests and quarrels of other nations, if you tangle her in the intrigues of Europe, you will destroy her powerful good, and endanger her very existence. Leave her to march freely through the centuries to come, as in the years that have gone. Strong, generous, and confident, she has nobly served mankind. Beware how you trifle with your marvelous inheritance; this great land of ordered liberty. For if we stumble and fall, freedom and civilization everywhere will go down in ruin. Lodge appealed to the patriotism of American citizens by objecting to what he saw as the weakening of national sovereignty: "I have loved but one flag and I can not share that devotion and give affection to the mongrel banner invented for a league." The Senate was divided into a "crazy-quilt" of positions on the Versailles question. It proved possible to build a majority coalition, but impossible to build a two thirds coalition that was needed to pass a treaty. One block of Democrats strongly supported the Versailles Treaty. A second group of Democrats supported the Treaty but followed Wilson in opposing any amendments or reservations. The largest bloc, led by Lodge, comprised a majority of the Republicans. They wanted a Treaty with reservations, especially on Article X, which involved the power of the League of Nations to make war without a vote by the United States Congress. Finally, a bi-partisan group of 13 "irreconcilables" opposed a treaty in any form. The closest the Treaty came to passage was in mid-November 1919, when Lodge and his Republicans formed a coalition with the pro-Treaty Democrats, and were close to a two-thirds majority for a Treaty with reservations, but Wilson rejected this compromise. Cooper and Bailey suggest that Wilson's stroke on September 25, 1919, had so altered his personality that he was unable to effectively negotiate with Lodge. Cooper says the psychological effects of a stroke were profound: "Wilson's emotions were unbalanced, and his judgment was warped. ... Worse, his denial of illness and limitations was starting to border on delusion." The Treaty of Versailles went into effect but the United States did not sign it, and made separate peace with Germany and Austria-Hungary. The League of Nations went into operation, but the United States never joined. Historians agree that the League was ineffective in dealing with major issues, but they debate whether American membership would have made much difference. In 1945 it was replaced by the United Nations, which assumed many of the League's procedures and peacekeeping functions, although Article X of the League of Nations was notably absent from the UN mandate. That is, the UN was structured in accordance with Lodge's plan, with the United States having a veto power in the UN which it did not have in the old League of Nations. Henry Cabot Lodge Jr., Lodge's grandson, served as U.S. Ambassador to the United Nations from 1953 to 1960. In 1922, President Warren G. Harding appointed Lodge as a delegate to the Washington Naval Conference (International Conference on the Limitation of Armaments), led by Secretary of State Charles Evans Hughes, and included Elihu Root and Oscar Underwood. This was the first disarmament conference in history and had a goal of world peace through arms reduction. Attended by nine nations, the United States, Japan, China, France, Great Britain, Italy, Belgium, the Netherlands, and Portugal, the conference resulted in three major treaties: Four-Power Treaty, Five-Power Treaty (more commonly known as the Washington Naval Treaty) and the Nine-Power Treaty, as well as a number of smaller agreements. In June 1922, he introduced the Lodge-Fish Resolution, to illustrate American support for the British policy in Palestine per the 1917 Balfour Declaration. Henry Cabot Lodge was one of the best informed statesmen of his time, he was an excellent parliamentarian, and he brought to bear on foreign questions a mind that was at once razor sharp and devoid of much of the moral cant that was so typical of the age. ... [Yet] Lodge never made the contributions he should have made, largely because of Lodge the person. He was opportunistic, selfish, jealous, condescending, supercilious, and could never resist calling his opponent's spade a dirty shovel. Small wonder that except for Roosevelt and Root, most of his colleagues of both parties disliked him, and many distrusted him. Lodge served on the Board of Regents of the Smithsonian Institution for many years. His first appointment was in 1890, as a Member of the House of Representatives, and he served until his election as a senator in 1893. He was reappointed to the Board in 1905 and served until he died in 1924. The other Regents considered Lodge to be a "distinguished colleague, whose keen, constructive interest in the affairs of the Institution led him to place his broad knowledge and large experience at its service at all times." Mount Lodge, also named Boundary Peak 166, located on the Canada–United States border in the Saint Elias Mountains was named in 1908 after him in recognition of his service as U.S. Boundary Commissioner in 1903. George Cabot Lodge (1873–1909), a noted poet and politician. 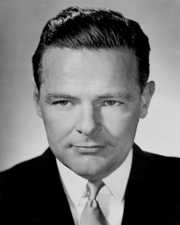 George's sons, Henry Cabot Lodge Jr. (1902–1985) and John Davis Lodge (1903–1985), also became politicians. John Ellerton Lodge (1876–1942), an art curator. On November 5, 1924, Lodge suffered a severe stroke while recovering in the hospital from surgery for gallstones. He died four days later at the age of 74. He was interred in the Mount Auburn Cemetery in Cambridge, Massachusetts. 1877. Life and letters of George Cabot. Little, Brown. 1883. Daniel Webster. Houghton Mifflin. 1887. Alexander Hamilton. Houghton Mifflin. 1889. George Washington. (2 volumes). Houghton Mifflin. 1891. Boston (Historic Towns series). Longmans, Green, and Co.
1891. "Lynch Law and Unrestricted Immigration". The North American Review. 152 (414): 602–612. May 1891. 1895. Hero tales from American history. With Theodore Roosevelt. Century. 1898. The story of the Revolution. (2 volumes). Charles Scribner's Sons. 1898. "The Great Peril of Unrestricted Immigration". The New Century Speaker for School and College. Ginn. 1898. pp. 177–179. 1902. A Fighting Frigate, and Other Essays and Addresses. Charles Scribner's Sons. 1906. A Frontier Town and Other Essays. Charles Scribner's Sons. 1909. Speeches and Addresses: 1884–1909. Charles Scribner's Sons. 1909. The Best of the World's Classics, Restricted to Prose. (10 volumes). With Francis Whiting Halsey. Funk & Wagnalls. 1910. The History of Nations. H. W. Snow. 1913. Early Memories. Charles Scribner's Sons. 1915. The Democracy of the Constitution, and Other Addresses and Essays. Charles Scribner's Sons. 1919. Theodore Roosevelt. Houghton Mifflin. 1921. The Senate of the United States and other essays and addresses, historical and literary. Charles Scribner's Sons. 1925. The Senate and the League of Nations. Charles Scribner's Sons. ^ "Henry Cabot Lodge Photographs ca. 1860–1945: Guide to the Photograph Collection". Massachusetts Historical Society Library. Retrieved July 28, 2011. ^ "How Henry Cabot Lodge earned his gold watch by John Mason". Yankee Magazine. August 1965. Archived from the original on 2010-08-23. ^ "U.S. Senate: Featured Bio Lodge". www.senate.gov. Retrieved 2016-11-30. ^ "Book of Members, 1780–2010: Chapter L" (PDF). American Academy of Arts and Sciences. Retrieved 14 April 2011. ^ David M. Tucker, Mugwumps: Public Moralists of the Gilded Age (1991). ^ Wilson, Kirt H. (2005). "1". The Politics of Place and Presidential Rhetoric in the United States, 1875–1901. pp. 32, 33. ISBN 978-1-58544-440-3. Retrieved November 19, 2011. ^ Leach, Eugene E. (1992). "Mental Epidemics: Crowd Psychology and American Culture, 1890–1940". American Studies. Mid-America American Studies Association. 33 (1). JSTOR 40644255. ^ Lodge, Henry Cabot (May 1891). "Lynch Law and Unrestricted Immigration". The North American Review. 152 (414): 602–612. JSTOR 25102181. ^ Puleo, Stephen (2007). The Boston Italians. Boston: Beacon Press. pp. 82–83. ISBN 9780807050361. ^ Puleo, Stephen (2010). Dark Tide: The Great Molasses Flood of 1919. Boston: Beacon Press. p. 34. ISBN 9780807096673. ^ Lodge, Henry Cabot (1892). Speeches. Houghton Mifflin. p. 46. ^ Lodge, Henry Cabot (1898). "The Great Peril of Unrestricted Immigration". In Frink, Henry Allyn (ed.). The New Century Speaker for School and College. Ginn. pp. 177–179. ^ O'Connor, Thomas H. (1995). The Boston Irish: A Political History. Back Bay Books. p. 156. ISBN 0-316-62661-9. ^ Berg, A. Scott (2013). Wilson. New York, NY: G.P. Putnam's Sons. p. 612. ISBN 978-0-399-15921- -3. ^ "Henry Cabot Lodge Senate Leader, Presidential Foe". United States Senate. Retrieved 19 August 2017. ^ David Mervin, "Henry Cabot Lodge and the League of Nations." Journal of American Studies 4#2 (1971): 201-214. ^ Brands 2008, part 3 at 0:00. ^ Edward C. Luck (1999). Mixed Messages: American Politics and International Organization, 1919–1999. Brookings Institution Press. p. 23. ^ "Mount Lodge". Geographic Names Information System. United States Geological Survey. Retrieved 2018-05-16. ^ Zimmermann 2002, p. 157. ^ "LODGE, John Davis - Biographical Information". bioguide.congress.gov. ^ Rand 1890, p. 381. ^ "Senator Lodge Suffers Shock in Hospital; Death May Come at Any Moment". The New York Times. November 6, 1924. p. 1. Retrieved November 21, 2009. ^ "Senator Lodge Dies, Victim of Stroke, in his 75th Year". The New York Times. November 10, 1924. p. 1. Retrieved November 21, 2009. ^ "Final Rites Said for Senator Lodge". The New York Times. November 13, 1924. p. 21. Retrieved January 31, 2010. Adams, Henry (1911). The Life of George Cabot Lodge. Boston and New York: Houghton Mifflin. ISBN 0-8201-1316-6. Brands, H. W. (March 11, 2008). Six Lessons for the Next President, Lesson 5: Leave Under a Cloud. Hauenstein Center at Grand Valley. Retrieved January 23, 2010. Donald, Aida D. (2007). Lion in the White House: A Life of Theodore Roosevelt. Basic Books. Garraty, John A. (February 2000). "Lodge, Henry Cabot". American National Biography. Retrieved June 30, 2014. Grenville, John A. S. and George Berkeley Young. Politics, Strategy, and American Diplomacy: Studies in Foreign Policy, 1873-1917 (1966) pp 201–238 on "The Expansionist: The education of Henry Cabot Lodge"
Hewes, James E. Jr. (August 20, 1970). "Henry Cabot Lodge and the League of Nations". Proceedings of the American Philosophical Society. American Philosophical Society. 114 (4): 245–255. Lodge, Henry Cabot (August 12, 1919). Treaty of peace with Germany: Speech of Hon. Henry Cabot Lodge. United States Senate, Washington, D. C.
Rand, John Clark (1890). One of a thousand: a series of biographical sketches of one thousand representative men resident in the commonwealth of Massachusetts, A.D. 1888–'89. First National Publishing. Retrieved 20 November 2009. Zimmermann, Warren (2002). First Great Triumph: How Five Americans Made Their Country a World Power. Farrar, Straus and Giroux. ISBN 0-374-17939-5. Wikimedia Commons has media related to Henry Cabot Lodge. Library of Congress: "Today in History: May 12"
United States Congress. "Henry Cabot Lodge (id: L000393)". Biographical Directory of the United States Congress. Henry Cabot Lodge Jr., sometimes referred to as Henry Cabot Lodge II, was a Republican United States Senator from Massachusetts and a United States ambassador. He was the Republican nominee for Vice President in the 1960 presidential election alongside incumbent Vice President Richard Nixon. The Republican ticket lost to Democrats John F. Kennedy and Lyndon B. Johnson. Hiram Warren Johnson was initially a leading American progressive and then a Liberal Isolationist Republican politician from California. He served as the 23rd Governor of California from 1911 to 1917 and as a United States Senator from 1917 to 1945. He was also Theodore Roosevelt's running mate in the 1912 presidential election on the Progressive ticket. Elihu Root was an American lawyer and statesman who served as the Secretary of State under President Theodore Roosevelt and as Secretary of War under Roosevelt and President William McKinley. He moved frequently between high-level appointed government positions in Washington, D.C. and private-sector legal practice in New York City. For that reason, he is sometimes considered to be the prototype of the 20th century political "wise man," advising presidents on a range of foreign and domestic issues. He was elected by the state legislature as a U.S. Senator from New York and served one term, 1909–1915. Root was awarded the Nobel Peace Prize in 1912. The Irreconcilables were bitter opponents of the Treaty of Versailles in the United States in 1919. Specifically, the term refers to about 12 to 18 United States Senators, both Republicans and Democrats, who fought intensely to defeat the ratification of the treaty by the Senate in 1919. They succeeded, and the United States never ratified the Treaty of Versailles and never joined the League of Nations. Henry White was a prominent U.S. diplomat during the 1890s and 1900s, and one of the signers of the Treaty of Versailles. 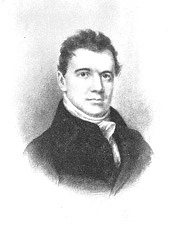 Elijah Hunt Mills was an American politician from Massachusetts. The presidency of Woodrow Wilson began on March 4, 1913 at noon when Woodrow Wilson was inaugurated as President of the United States, and ended on March 4, 1921. 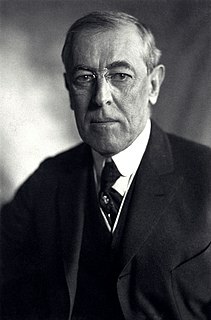 Wilson, a Democrat, took office as the 28th U.S. President after winning the 1912 presidential election, gaining a large majority in the Electoral College and a 42% plurality of the popular vote in a four–candidate field. Wilson was re-elected in 1916, defeated Republican Charles Evans Hughes by a fairly narrow margin. He was the first Southerner to be elected president since Zachary Taylor in 1848, and just the second Democrat to be elected president since 1860. The Lodge Reservations, written by United States Senator Henry Cabot Lodge, the Republican Majority Leader and Chairman of the Committee on Foreign Relations, were fourteen reservations to the Treaty of Versailles and other proposed post-war agreements: the Treaty called for the creation of a League of Nations in which the promise of mutual security would hopefully prevent another major world war; the League charter, primarily written by President Woodrow Wilson, let the League set the terms for war and peace. If the League called for military action, all members would have to join in. The 1916 Republican National Convention was held in Chicago from June 7 to June 10. A major goal of the party's bosses at the convention was to heal the bitter split within the party that had occurred in the 1912 presidential campaign. In that year, Theodore Roosevelt bolted the GOP and formed his own political party, the Progressive Party, which contained most of the GOP's liberals. William Howard Taft, the incumbent president, won the nomination of the regular Republican Party. This split in the GOP ranks divided the Republican vote and led to the election of Democrat Woodrow Wilson. Although several candidates were openly competing for the 1916 nomination—most prominently conservative Senator Elihu Root of New York, Senator John W. Weeks of Massachusetts, and liberal Senator Albert Cummins of Iowa—the party's bosses wanted a moderate who would be acceptable to all factions of the party. They turned to Supreme Court Justice Charles Evans Hughes, who had served on the court since 1910 and thus had the advantage of not having publicly spoken about political issues in six years. Although he had not sought the nomination, Hughes made it known that he would not turn it down; he won the nomination on the third ballot. Former Vice-President Charles W. Fairbanks was nominated as his running mate. Hughes was the only Supreme Court Justice to be nominated for president by a major political party. Fairbanks was the last former vice president, to be nominated for vice president. The Massachusetts United States Senate election of 1936 coincided with the landslide re-election of Democratic incumbent President Franklin D. Roosevelt over Republican candidate Alf Landon. The 1952 United States Senate election in Massachusetts was held on November 4, 1952. Incumbent Republican Henry Cabot Lodge Jr. lost to John F. Kennedy, the Democratic Party nominee. This election marked the end of the Lodge family dynasty and the beginning of the Kennedy family dynasty.